Ever wonder why certain bands gain a modest level of critical and audience acclaim, only to never ascend to that comfort level of making a living off of their art? A ridiculous notion for sure, to think that musicians deserve to be properly compensated for their creative endeavors – but pre-internet and especially in the metal realm, you had many artists who did this from Iron Maiden and Metallica to Dream Theater. 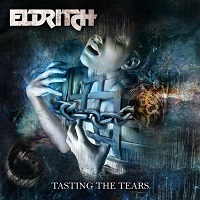 Since their debut album Seeds of Rage in 1995, the Italian power/progressive metal act Eldritch has steadily issued strong studio output, yet struggle to reach that breakthrough for honor, respect, and fiscal peace of mind. A discography that twists and turns with aspects of traditional metal, thrash, and power riffing – yet exemplary interplay between the musicians keeps the group firmly in the progressive metal category without being a mere Dream Theater or Fates Warning clone. 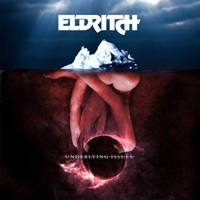 Eldritch’s tenth studio platter Underlying Issues could be their best release since 1998’s El Niño, as the band hone in on a unique blend of stirring musical hooks and searing melodies. Stagnation is not a part of their makeup – pushing forward against any sort of ‘in’ genre as the trend train steamrolls ahead. Reaching out to vocalist Terence Holler you will find his realism penetrates beyond Eldritch’s lyrics. Prepare to take a voyage into their history, including possible plans for a 20th anniversary celebration of El Niño, the joys of being a single parent, and why continuous style changes may have cost the band any surge of wide spread popularity. Dead Rhetoric: The band started in 1990 as Zeus before changing names to Eldritch, which was a song on a Watchtower album that everyone loved in the band at the time. Can you take us back to those early days and the significant events that took place to shape up the band for their first label deal in 1995 with InsideOut Music? Dead Rhetoric: The first two albums set a progressive metal foundation for the group – but to my ears, El Niño is where you established your own identity and made an impact for its diverse dynamics. How do you feel about this record and did it launch Eldritch into new territories as far as critical acclaim and success? Holler: Oh yeah, the El Niño album showed our natural development of style. We never really followed (or wanted to), the Dream Theater wannabe’s. We grew up with Annihilator, Fates Warning, Watchtower, Coroner, Queensrÿche and early Metallica…. In fact, this album launched us into the international scene, especially in the US. The first 2 albums did have great success but most of all in Europe and Asia, but El Niño finally showed the songwriting talent and the unique style of Eldritch to the rest of the world. We’re proud to say that we sound like Eldritch and no other band! Of course, you can hear some different influences, but our songwriting is really original and personal…. Dead Rhetoric: There was a four year gap between Blackenday and Gaia’s Legacy. Was this a result of lineup changes, label shuffling, or personal events taking place where a break seemed necessary? Holler: The 4 year gap was due to a lot of issues within the band!! Eugene and I had serious family problems and as you might know, we are the composers of all Eldritch songs since the beginning. Apart from our personal problems, we also wanted to change record companies and a few band members… I mean, all these things together took all our mental energies, so we took many, many years to fix up the lineup and our minds. So yes, the break was totally necessary and healthy! Dead Rhetoric: You’ve lived in Brooklyn, New York beyond your current Italian homebase. Tell us your views of your time here – the good, the bad, the ugly. What takeaways have you been able to apply either personally or professionally? Holler: I was born and grew up between Brooklyn and Long Island. My grandparents moved from Italy to New York in the late 50’s and part of my family and relatives are still there. My father decided to move to Italy in the 80’s because he was tired of the New York City life chaos!! We moved into a little paradise in Tuscany, on the seaside, just 30 minutes from Pisa and an hour from Florence. I brought with me my music taste from singers like Billy Joel and Bruce Springsteen, which I listened to on the radio many, many times. Plus, I started listening to heavier acts like Kiss, Bon Jovi and Metallica. I applied my typical American professionality- the art of ‘I’ll make it one day’. This is something that most Italians don’t have!!! Italians usually want things easily, with no big sacrifice. I was lucky to meet Eugene Simone, he’s Italian but his mentality is in the American way. Dead Rhetoric: Eldritch seems to embrace a fluid philosophy when it comes to songwriting throughout its career- as aspects of power, progressive, thrash, and traditional metal come into play depending on the song or album we choose to look at. Has that been important through the years – to advance as experience and life circumstances dictate, and do you think your fans appreciate the fact that each album is going to be a little different than the last? Holler: Well, we don’t really follow any kind of rules. We just write down in music what are our feelings and our mood in that moment are. Especially for myself, because I am the lyric and vocal melody writer. I think this is the reason why we never really became a bigger band, these continuous style changes without jumping on any trend-train caused us some fan-loss- but that’s how we are! We’re real, passionate songwriters. This is also why we changed a few record companies, they’ve been telling us to do things the way it “should be done” to have more success but we never really cared!! I know it might have been a mistake, but we prefer having 20,000 die-hard Eldritch fans than having 100,000 fans of a music genre that just listen to us…. know what I mean?? Our record sales are constantly growing and our fan base too. This means we’re doing it right! Maybe in another 30 years we’ll become really huge!! 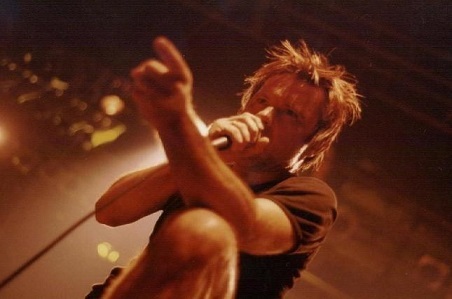 Dead Rhetoric: Underlying Issues is the tenth Eldritch studio album – did you come up with the title first (and please discuss its different meanings) and what was the approach when it came to the recording and songwriting? Which tracks are the highlights in your eyes? Holler: To be honest the title was the last thing! We decided it after the recordings were over. I mean, the lyrics are as usual a kind of open diary of my last 2 years of life and as soon as the recordings were over we thought that the perfect title was Underlying Issues. 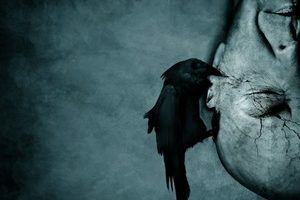 This is because a lot of people say that I look like a happy man seen from their side, but under the surface I’m really full of problems!! So as you can see the artwork is perfect! I’m like a human iceberg, the biggest part of me is under the surface, and it’s not so nice. Regarding the songs, I know it might sound obvious, but there are at least 7 or 8 potential hits on this record. My favs are “Danger Zone”, “The Face I Wear” and “To the Moon and Back”, but believe me, the whole album is catchy as hell even though it’s quite progressive and unique.